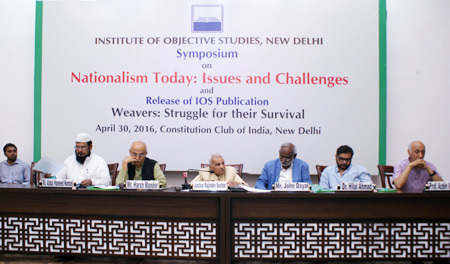 New Delhi: A symposium on “Nationalism Today: Issues and Challenges” was organised by the Institute of Objective Studies on April 30, 2016 at the Deputy Speaker’s Hall, Constitution Club here. 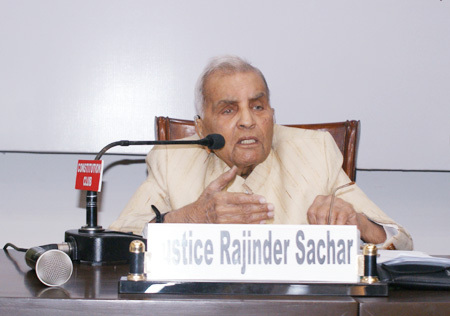 Justice Rajinder Singh Sachar, former Chief Justice of the Delhi High Court, who presided over the symposium, said that nationalism implied that all citizens of India irrespective of their religions, caste, creed, etc. were equal. The Preamble to the Constitution too states that India is a secular and democratic society. Referring to the last Haj sermon of the Prophet of Islam (PBUH), he said that the prophet (PBUH) emphatically stated that the white skinned would hence have no presidence over the black skinned and vice-versa. There was unequivocal message of Islam, he observed. Similarly Jesus Christ said that he would not embrace the wealthy. Holding that Hinduism was not superior to Islam, he noted that any government formed on religious basis would not last long. Lambasting the Central government for mishandling the JNU issue, he said that it was a disaster. He charged the government with a design to destroy the JNU. Commenting on the existing law of sedition, he maintained that as president of the People’s Union of Civil Liberties he had appealed to all political parties to press the government for its repeal. He wondered as to why political parties were not moving ahead to demand withdrawal of the sedition law. He said that due to this obnoxious law, a number of Muslims languished in jails for years together and were ultimately freed for want of evidence during the trial. This had badly affected such youth whose precious years had gone down the drain. Lauding the role of Brigadier Usman during the Indo-Pak War in 1965, Justice Sachar said that though the veteran freedom fighter and India’s first Education Minister, Maulana Azad was proud to be a devout Muslim, he never spoke for Muslims only; he pleaded for equal rights to Hindus, Muslims and Christians. In 1921 Mahatma Gandhi had also described Hindus and Muslims as his two eyes. If one of his eyes was lost, he would lose half of his vision. Raising the problems faced by the weavers of UP he said that during his last visit to Lucknow he had urged the state chief minister to address their issues, particularly the difficulty in procuring yarn. 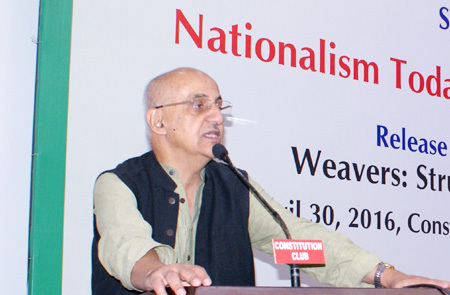 Social activist Harsh Mander expressed concern over the phase of aggressive nationalism India was passing through. Tracing the idea of nationhood, he said that gender, faith, etc. did not matter when such an idea emerged. Two ideas, viz, the idea of Pakistan and the Idea of India emerged. While the idea of Pakistan was driven by lack of security to Muslims, the idea of India then was based on confidence among the people, respect for each other’s culture and religion. He explained that the idea of Pakistan with one religion was challenged in several ways. This idea collapsed with the separation of East Pakistan and emergence of an independent country called Bangladesh. It was alleged that some three million Bangladeshis were killed by the Pakistani establishment. Similarly, Muhajirs (migrants) faced persecution in Pakistan despite professing the same religion. In India, Hindutva found an echo in the writings of VD Savarkar who belonged the Hindu Mahasabha. This idea came into conflict with the concept of liberty, equality and fraternity. He said that the Ayodhya movement was a flashpoint. Being a temple town, Ayodhya had a large number of temples, quite a few of them believed to be the birth place of Shri Ram. But the protagonists of the temple movement persisted with their view that the place where the Babri Masjid once stood was the precise birth place of Shri Ram. They held that it was a matter of their faith and demanded that the mosque be removed in respect of the sentiments of the majority, the Hindus. He said that they treated Muslims as the enemy within. The idea that the nation belonged to the Hindus who were in the majority was contrary to the spirit of the Indian Constitution. At a time when the RSS had completed 90 years of its existence, it had become more outspoken and virulent. Though there were various castes within the Hindu fold, it was the Hindutvadis who declared that they would determine who was a Hindu. There was a difference between Shri Ram of the Hindu nationalists and Gandhiji. On one hand it was Shri Ram of Nathu Ram Godse who killed Gandhiji, on the other it was Ram of the latter who uttered “Ram” while falling to the assassins’ bullet. Thus the question arose who represented the real Ram, he noted. Harsh Mander observed that India’s unity lay in its diversity, its different religions and languages. There was a community in Arunachal Pradesh which had a population of only 300. But that survived; their language and culture where intact. On the contrary, BJP’s idea of nationalism was exclusive as it called for the homogeneity of Hindus. He stressed that it should be within the four walls of the Constitution. He said that the state had a duty to intervene if the Constitution was flouted. He called for preserving the idea of friendship, brotherhood and mutual caring. 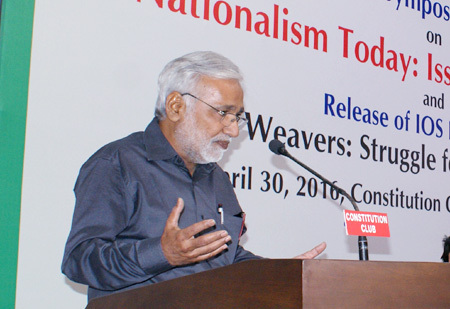 Senior journalist and activist, John Dayal raised the question of conversions by saying that the Constitution did not prohibit it. But, of late, Christians were being accused of organising forcible conversions. Referring to the persecution of Christians by the Ravi Shankar Shukla government in Madhya Pradesh decades ago, he said that the first Prime Minister, Pandit Jawaharlal Nehru had advised him against playing with fire. He held that raids were organised against churches in MP and the Christian community was under extreme stress due to threats. He said that the persecution of Christians was more than that of the Muslims. Due to the scattered population of Muslims, attacks on then were not as organised as on the Christians. He noted that the Christians were charged with receiving money from the West for conversions. Voicing concern over the systematic undermining of the independence of various institutions, he said that the Constitution was under threat. Holding that the rights guaranteed to Muslims and the Christians had for all practical purposes come down to 50 percent, he said that though there was no caste system in Islam, Christianity and Buddhism. Yet, the people belonging to Scheduled Castes lost the benefits they enjoyed as a sequel to their conversion to these religions. He also raised the issue of fishermen of the Gujarat coast who were mostly Christians. He said that their livelihood was threatened by the deployment of trawlers and dumping of nuclear waste. He called for urgent attention to this problem. 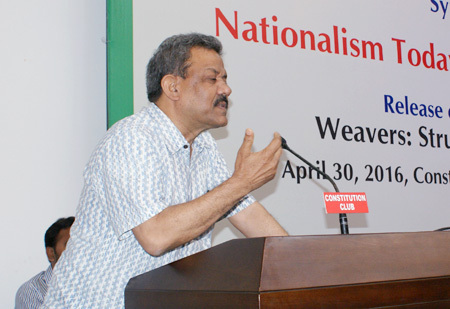 Prof. Achin Vanaik of Delhi University held that nationalism was comparatively a modern phenomenon. Nationalism was not inherited from the past. He said that nationalism was more powerful than religious nationalism. Nationalism was identified with the community of citizens. He maintained that the state had to be secular while dealing with different religious groups. It had to respect the imperatives of religion. He pleaded that there should be a democratic nationalism. While calling for the fight for democratic justice, he said that it should be fought at the political, judicial and the citizens’ level. He deplored that despite commitment, the caste system had not yet been outlawed. Any attempt at curbing the freedom of speech must also be fought. Laying emphasis on the change of public discourse, he said that access to the media should be increased. He noted that fundamentalist forces were formidable and they could be confronted only when a united fight was put up against them. 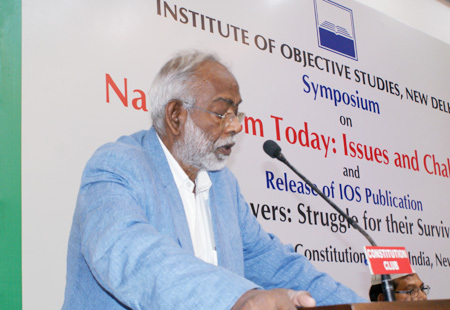 Senior journalist and broadcaster, Urmilesh opined that the idea of India had several shades before and after independence. This had now emerged as a problem with language and economy, its other constituents. That today’s idea of India was full of contradictions was obvious from the fact that both Sardar Bhagat Singh and Dr BR Ambedkar were removed from public perception. 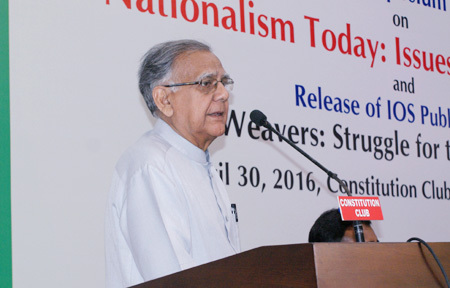 He said that the emergence of BJP’s nationalism was the failure of Gandhi-Nehru model of nationalism. He explained that the Hindu upper castes were behind the idea of Hindu nationalism and this found favour with them irrespective of their party affiliations. They might be conservative or progressive, but they gave full support to the idea of Hindu nationalism. He said that it was Kanshi Ram who for the first time made Dalit assertion a focal point in Indian politics. He brought Ambedkar to life. But Mayawati frittered away all gains he had made. He believed that something positive could emerge if the ideas of Bhagat Singh and Dr Ambedkar were put together. Stressing the need for a better connect with the people, he said that a big movement must be launched for the purpose. He also held that a course correction would have to be made if the RSS had to be marginalised. 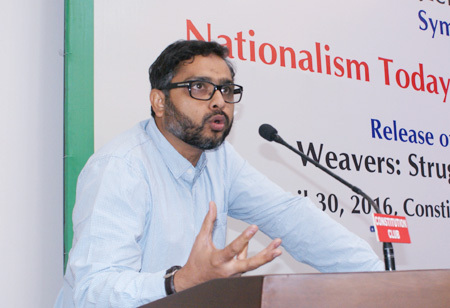 Prof. Rizwan Qaiser of the JMI said that the question of nationalism was as old as 100 years. Earlier Muslims were dubbed as Arabian progenies, but it had now changed. There was no need to prove our nationalism as 95 percent of the Muslims were Hindus 4-5 generations ago, he said. 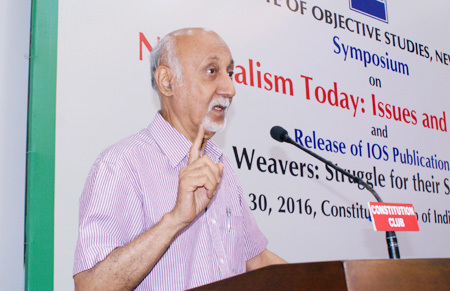 Dr Hilal Ahmed from CSDS held that the word Hindutva was first used by the Hindu Mahasabha leader Veer Savarkar. The BJP put the term into its election manifesto after 1996 when Justice JS Verma, judge of the Supreme Court, defined it in his judgment. Later, it was used by Arun Shourie in his book and Narendra Modi during the electioneering in 2014. 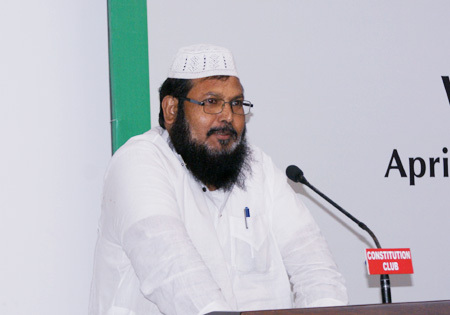 Maulana Abdul Hameed Nomani, Secretary, Jamat-i-Ulemae Hind, remarked that nationalism threw up several questions that needed to be answered. Hindu nationalism was being renamed as Indian nationalism. He explained that while Hindu religious texts had no mention of patriotism, the country was being sought to be divided in the name of Hindu nationalism. This concept of nationalism was based on hatred. He said that if this nationalism was positive in its nature then every Indian without regard to caste and creed was a nationalist. In order to establish its identity, RSS was trying to divide society by using hatred as a tool. We are still undecided about our strategy to counter this move. Referring to Guru MS Golwalkar’s book A Bunch of Thoughts, he said that during a meeting Golwalkar and Nehru agreed to work towards the consolidation of Hindus. 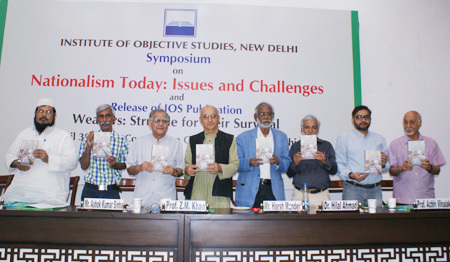 On this occasion, IOS publication based on the research study on “Weavers: Struggle for their Survival” by Ashok Kumar Sinha, Development Professional was also released. This book objectively looks into the different dimensions of the lives of the weavers in Northern India and their struggles for survival. With the advent of new technologies in the growing globalised world and the policies of privatization, globalization and liberalization, the weaver community has been facing enormous challenges to remain afloat and survive. The book analyses the impacts of various services / schemes and initiatives of the governments for the weaver community. After the assessment of their situation and efforts by the government, the book recommends the areas of policies and intervention programmes to provide effective relief and rehabilitation to the weavers to handle the adversities that they are facing today. Earlier, the Secretary General, IOS, Prof. ZM Khan welcomed the guests and explained the topicality of the subject. He hoped that the deliberations at the symposium would send a message which would go far and wide. The symposium began with a recitation from Holy Qur’an by Hafiz Nazeerul Hasan. While Asstt. Professor of Political Science, Zakir Husain College, University of Delhi, Dr Md Aftab Alam conducted the proceedings, Advocate on Record, Supreme Court of India, Mushtaq Ahmed proposed a vote of thanks. A large number of social activists, human rights activists, social scientists, academics and prominent citizens were present on the occasion.